Portugal’s capital Lisbon is a veritable delight waiting to be discovered, and with careful planning many of its iconic and emblematic visitor attractions can be ticked off on a memorable weekend city break. Much of the city can be explored on foot, though you’ll need a stout pair of legs to tackle some of its steeper hills. Fortunately the destination is served by a cheap and convenient public transport network, which includes a tramline and several funiculars. The metro is fast and efficient, and a bus ride is always an option. 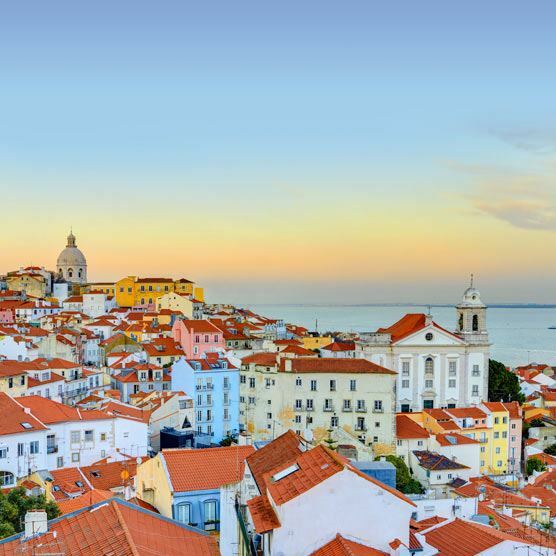 In fact, consider purchasing a 48-hour Lisbon Card and enjoy free travel and free access to a host of museums, monuments and other must-see sights when planning the top things to do in Lisbon, Portugal. Joining an organised city tour by hop on-hop off double-decker bus takes you past the top sights of Lisbon, without having to fret about planning routes or poring over schedules. Alternatively, flag down a tuk tuk and let the chatty and knowledgeable driver whisk you off on a fun-packed excursion through this most charming and enigmatic of European cities. First impressions count, and for a memorable introduction to Lisbon, nip aboard the number 28 tram. Riding it will give you a full tour of the city and if you’re in possession of a Lisbon Card you can alight at any time along the route. The tram is a novel way to reach Castelo de São Jorge, a sightseeing highlight. The hilltop stronghold affords jaw-dropping views over the city and the sparkling River Tagus. Moving on, the streetcar lurches and hisses a meandering path through Alfama, Lisbon’s old Moorish quarter. Alight here and allow an hour or so to get lost in its maze of narrow streets and cobbled squares. Later, why not digest the local character over a snack in any one of Alfama’s charming backstreet tabernas? For lunch saunter over to Bairro da Avillez for traditional fare (seafood is the speciality) or for something more exotic Boa Bao, with its spicy Asian offerings themed around Portugal’s golden age of discovery. Suitably refreshed, you can either resume your tram ride or take the metro to Parque das Nações and spend the afternoon at the Oceanário, one of the country’s most popular tourist attractions and a hit with families. Europe’s second largest oceanarium is teeming with seriously happy fish—sleek sharks and graceful rays, among other amazing denizens of the deep. If you’ve time afterwards take a flight in the cable car skirting the river. Round off your first day in Lisbon in Bairro Alto, the city’s lively boho district. Bundle into funky Clube da Esquina for a pre-dinner aperitif, or savour a glass of wine at the Old Pharmacy Wine Inn, a wine bar converted from a former dispensary. For traditional Portuguese fare, head for Antigo de 1 Maio or Farta Brutos, for fresh seafood risotto's, traditional pork dishes and more for a reasonable 30€. For a real treat pre-book a table at O Faia, one of the city’s most celebrated fado restaurants. Michelin has given the cuisine at O Barrigas a nod, and Sophia La Loca (Crazy Sophia) serves some of the tastiest tapas in town. Have breakfast early, perhaps at Casa Brasileira in Rua Augusta or, if you’re staying in the city’s Anjos district, out-of-the-way Brick Café. Then spend the morning in Belém, the leafy riverside suburb synonymous with Portugal’s golden Age of Discovery. Immerse yourself in the splendour that is Mosteiro dos Jerónimos, a beautiful 16th-century monastery which houses the tomb of the great Portuguese navigator Vasco da Gama. Nearby is Torre de Belém, equally exuberant in its architectural detail. Both these sites are deserving of their UNESCO World Heritage status. For a bird’s-eye view of the whole area and the fantastic pavement compass set in front of it, nip to the top of the Monument to the Discoveries, lined either side with impressive stone statues of heroes linked with the Age of Discovery. Pause at the historic Antiga Confeitaria de Belém for one of their Pastéis de Belém, the famous custard tarts are a must-buy while in the area - foodies can savor with heaps of icing sugar and cinnamon. If you’re up for a spot of lunch too, consider Enoteca de Belém, a cozy little wine and tapas bar situated off the main street, or for casual riverside dining, the art deco-styled Espaço Espelho d’Agua. You could spend an entire day in Belém, especially if you opt to visit the engaging Museu Nacional dos Cochas (National Coach Museum) and the contemporary art collection housed in the Centro Cultural de Belém. But if you decide to head back into town, don’t miss the Museu Calouste Gulbenkian, a world-class museum brimming with priceless exhibits spanning over 4,000 years. Culture vultures will also be won over by the rare and wonderful paintings displayed Museu Nacional de Arte Antiga, which houses Portugal’s national art collection. And here’s a little secret. Behind the plain nondescript façade of Chiado’s Igreja de São Roque is one of the most richly decorated interiors of any church in Portugal! In the evening, take a stroll along the river between Cais do Sodré and Ribeira das Naus where you can catch the colourful sunset. The terrace bars and cafes lining Praça do Comércio are perfect for a sundowner too - Aura has tables set out over the esplanade. Back in Cais do Sodré there are some great places for dinner. Casa de Pasto with its menu of traditional Portuguese gastronomy is recommended, alongside Flor do Cais do Sodré, which serves up a hearty Mediterranean menu. For a more Spanish flavour, grab a table at Meson Andaluz, but if you really want to be spoiled for choice, amble along to Mercado da Ribeira, a sprawling food hall that mixes stalls from top chefs with the food ranging from Thai noodles and Japanese sushi to Michelin finger food and steak sandwiches. Round of your final day in party central “Pink Street”, the rose-coloured pedestrianized thoroughfare lined with hip hangouts such as Pensão Amor, Sol e Pesca and Duplex. If you want a mix of city and beach vibes, there are several excellent beaches within striking distance of the Portuguese capital, notably the blue-flag Praia de Carcavelos—a favourite with surfers and easily reached by rail from Cais do Sodré. Another renowned watersports destination is Praia do Guincho. Set well out of town along the Lisbon coast, this huge expanse of sand is a premier kite boarding and windsurfing spot. If you’ve a flexible itinerary and want to hit the ground running, find time to visit beautiful Sintra. Located around 40-minutes north of Lisbon and easily reached by train from the city’s Rossio terminal, this charming destination was long ago declared a World Heritage cultural landscape by UNESCO. The old town is dominated by the 14th-century Palácio Nacional de Sintra, once the summer retreat of Portugal’s monarchs. High above the town is a 10th-century Moorish castle, its ramparts snaking over the lip of a granite escarpment. Higher still is the whimsical Palácio da Pena, perched at the very top of the wooded and verdant Serra da Sintra hills.